Bar/prep faucets go beyond the kitchen, to butler's pantries, morning kitchens and more. Touch on. Touch off. With Touch2O<sup></sup> Technology, it doesn't matter if you have two full hands or ten messy fingers. Tap anywhere on the spout or handle of the faucet with your hand, wrist or forearm to start and stop the flow of water. Thoughtfully designed to make kitchen tasks easier, Touch2O Technology allows you to turn the faucet on and off with just a touch anywhere on the faucet's spout or handle. It was the first innovation of its kind on the market, and now offers more styles, finishes and options than ever. Designed for precise, responsive control every time, no matter where you touch. You can easily control and change the water temperature above the deck using the faucet handle. All Touch2O models are water-efficient, underlining Delta's commitment to conservation. The pull-down spray wand comes free with a gentle tug and gives you total flexibility. This Essa Single-Handle Bar Faucet in Chrome with MagnaTite Docking features a soft contemporary take on a euro design with subtle detailing accents that allow the faucet to blend with contemporary and transitional design. The pull-down spray wand comes free with a gentle tug and gives you total flexibility. The hose extends and retracts without friction points, fed by gravity. As you raise the wand to dock it, the magnet embedded in the spout pulls the wand precisely into place. So, unlike other pull-downs that tend to droop over time, MagnaTite keeps your pull-down faucet looking picture-perfect. Delta's exclusive DIAMOND Seal Technology uses a valve with a tough diamond coating. InnoFlex PEX waterways keep water inside the faucet out of contact with potential metal contaminants. This powerful combination brings you a faucet built to last up to five million uses. This Essa Touch2O Technology Single-Handle Bar Faucet in Arctic Stainless with MagnaTite Docking features a soft contemporary take on a euro design, with contemporary and transitional elements. Thoughtfully designed to make kitchen tasks easier, Touch2O Technology allows you to turn the faucet on and off with just a touch anywhere on the faucet's spout or handle. You can easily control and change the water temperature above the deck using the faucet handle. TempSense Technology measures the water temperature in the faucet. The LED light at the base of the faucet changes from blue to magenta to red depending upon the temperature of the water to let you know when the water temperature is right for you. A/C adapter EP73954 is available to purchase separately as an option to avoid changing batteries. Even if the adapter is used, batteries are still recommended as a back-up if power goes out. Once power is restored, the solenoid valve will automatically revert back to using A/C power. Single Handle Bar/Prep Faucet, Arctic Stainless Bar/prep faucets go beyond the kitchen, to butler's pantries, morning kitchens and more. 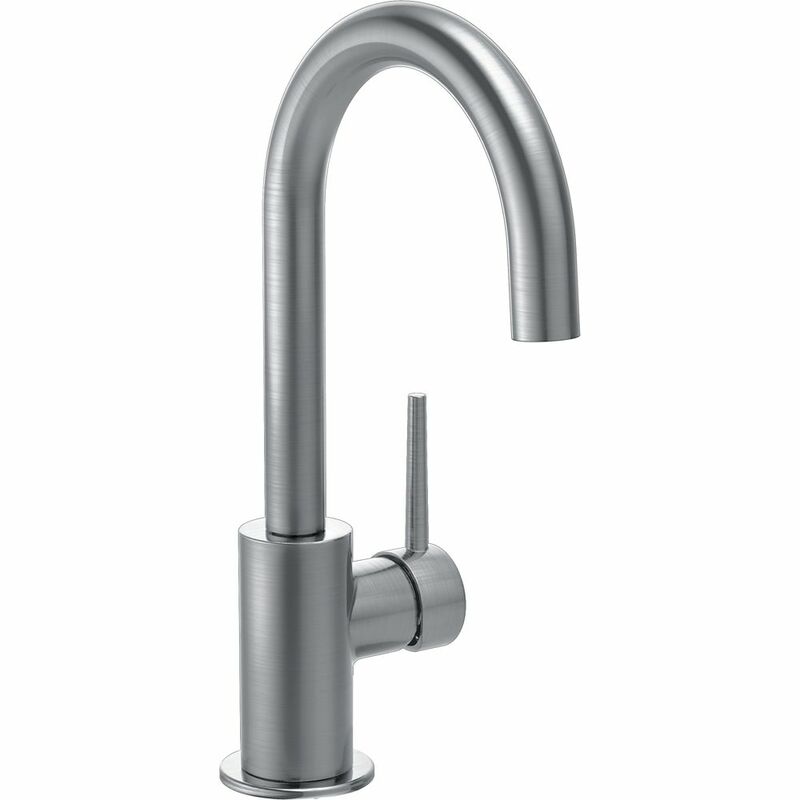 Single Handle Bar/Prep Faucet, Arctic Stainless is rated 4.5 out of 5 by 20. Rated 5 out of 5 by HomeDepotCustomer from Not yet assembled. ... Not yet assembled. Rated 5 out of 5 by Kmestas from Great look, great water pressure, I would buy again! Great look, great water pressure, I would buy again! Rated 5 out of 5 by Kelly from Perfect match to my other fixtures in the kitchenette. ... Perfect match to my other fixtures in the kitchenette. Rated 5 out of 5 by HomeDepotCustomer from Great quality and perfect size!... Great quality and perfect size! Rated 2 out of 5 by Michelle from Color not as shown. ... Color not as shown. Rated 4 out of 5 by Philbo130 from We are remodeling our kitchen and I wanted a faucet... We are remodeling our kitchen and I wanted a faucet that looks good with polished brass cabinet pulls and hardware. This faucet was really reasonably priced, but looks very designer. Rated 5 out of 5 by TJ13 from Beautiful Hardware... I have used Delta hardware throughout my home during a gut reno...in the kitchen and bath...LOVE IT!